~~Mike McGuckin is a NHMRC Principal Research Fellow and is Deputy Director (Research) at at the Mater Research Institute – The University of Queensland within the new Translational Research Institute in Brisbane, where he leads the Inflammatory Disease Biology and Therapeutics Research Group. Mike is the author of over 130 scientific publications with his research currently focused on mucosal infection, chronic inflammation and cancer in the gastrointestinal tract, and has held 4 patents. He has particular interests in the role of secreted and cell surface mucin glycoproteins in cancer and in host defense from infection and inflammation. Mike also has a strong interest in the role of protein misfolding and ER stress in secretory cells in chronic inflammatory disease, including diabetes. He is heavily involved in national and international peer review, is on the Editorial Boards of four international journals, and has served as the lead member of the Academy of the Australian National Health and Medical Research Council for Gastroenterology. Mike chairs the Mater Research Committee, and serves on the Research Committees of the Gastroenterology Society of Australia, University of Queensland Faculty of Medicine and Biomedical Sciences and chairs the Facilitations Committee of the Translational Research Institute. 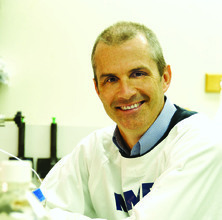 In addition he is an elected Councilor for the International Society for Mucosal Immunology, and serves on the Board of Directors and Chairs the Medical and Scientific Advisory Committee for the Cancer Council Queensland, and is a member of the ANZ Trustees Limited Queensland Medical Research Grant Program Advisory Committee, and the Research and Development Committee for the Autism Collaborative Research Centre. McGuckin, M. A., Ouellette, A. J. and Wu, G. D. (2013). Secreted effectors of the innate mucosal barrier. In Phillip D. Smith, ThomasT. MacDonald and Richard S. Blumberg (Ed. ), Principles of mucosal immunology (pp. 37-51) London, United Kingdom: Taylor & Francis. Linden, Sara K. and McGuckin, Michael A. (2010). Microbes at the host surface. In A. Mendez-Vilas (Ed. ), Current research, technology and education topics in applied microbiology and microbial biotechnology (pp. 591-596) Badajoz, Spain: Formatex Research Center. There is a 'uc' in mucus, but is there mucus in UC? McGuckin, Michael A. and Thornton, David J. (2012) Preface: introduction to mucin biology and technical challenges of mucin research. Mucins: Methods and Protocols, 842 . Packer, L. M., Williams, S. J., Callaghan, S., Gotley, D. C. and McGuckin, M. A. (2004) Expression of the cell surface mucin gene family in adenocarcinomas. International Journal of Oncology, 25 4: 1119-1126. Robertson, DM, Cahir, N, Burger, HG, Mamers, P, McCloud, PI, Pettersson, K and McGuckin, M (1999) Combined inhibin and CA125 assays in the detection of ovarian cancer. Clinical Chemistry, 45 5: 651-658. Williams, S., McGuckin, M. A., Gotley, L. D. C., Eyre, H., Sutherland, G. R. and Anatalis, T. (1999) Two novel mucin genes down-regulated in colorectal cancer identified by different display. Cancer Research, 15 59: 4083-4089. Williams, S., McGuckin, M. A., Gotley, D. C., Eyre, H. J., Sutherland, G. R. and Antalis, T. M. (1999) Two novel mucin genes down-regulated in colorectal cancer identified by differential display. Cancer Research, 59 16: 4083-4089. McGuckin, MA, Quin, RJ and Ward, BG (1998) Progesterone stimulates production and secretion of MUC1 epithelial mucin in steroid-responsive breast cancer cell lines. International Journal of Oncology, 12 4: 939-945. Devine, PL, Walsh, MD, McGuckin, MA, Quin, RJ, Hohn, BG, Claque, A and Samaratunga, H (1995) Prostate-specific antigen (PSA) and cancer-associated serum antigen (CASA) in distinguishing benign and malignant prostate disease. International Journal of Biological Markers, 10 4: 221-225. MCGUCKIN, MA and DEVINE, PL (1995) THE MUCIN MARKER, CASA, IN OVARIAN-CANCER. Tumordiagnostik & Therapie, 16 1: 1-6. McGuckin M.A. and Devine P.L. (1995) The mucin marker, CASA, in ovarian cancer. Tumor Diagnostik und Therapie, 16 1: 1-6. Devine, P. L., Yarker, J. Y., Fong, K. M., McGuckin, M. A., Scells, B., Ward, B. G., Thynne, G. S. and Zimmerman, P. V. (1994) Serum markers CASA, CEA, CYFRA 21-1, MSA, NSE, TPA and TPS in lung cancer. International Journal of Oncology, 4 5: 1129-1134. Are CASA and CA125 concentrations in peripheral blood sourced from peritoneal fluid in women with pelvic masses? McGuckin, MA, Devine, PL, Ramm, LE and Ward, BG (1994) Factors Effecting the Measurement of Tumor-Associated Muc1 Mucins in Serum. Tumor Biology, 15 1: 33-44. Devine P.L. and McGuckin M.A. (1994) The cancer-associated serum antigen (CASA) in the management of patients with carcinoma. Australian Journal of Medical Science, 15 4: 126-132. Devine, PL, McGuckin, MA, Ramm, LE, Harada, H and Ward, BG (1993) The Use of Mucin-Specific Monoclonal-Antibodies and Lectins in the Detection of Tumor-Associated Serum Markers in Gynecological Cancer. Cancer Biochemistry Biophysics, 13 4: 221-238. Ward, BG, Joy, GJ, Ramm, LE, Baker, CA and McGuckin, MA (1992) Comparative-Study of Mammography and Mammary Serum Antigen Estimation for Breast-Cancer Screening. Medical Journal of Australia, 157 3: 161-164. Devine, PL, McGuckin, MA and Ward, BG (1992) Circulating Mucins as Tumor-Markers in Ovarian-Cancer. Anticancer Research, 12 3: 709-717. MCGUCKIN, MA, WRIGHT, G and WARD, BG (1991) EXPRESSION OF A POLYMORPHIC EPITHELIAL MUCIN ANTIGEN DEFINED BY THE MONOCLONAL-ANTIBODY BC2 IN OVARIAN-CARCINOMA - USE OF THE BC2 ANTIBODY FOR THE DETECTION OF MICROMETASTASES. American Journal of Clinical Pathology, 96 1: 46-52. MCGUCKIN, MA and BLACKSHAW, AW (1991) MATING-ASSOCIATED PEAK IN PLASMA TESTOSTERONE CONCENTRATION IN WILD MALE GRAY-HEADED FLYING FOXES (PTEROPUS-POLIOCEPHALUS). Journal of Reproduction and Fertility, 92 2: 347-352. Ward B.G., McGuckin M.A., Ramm L. and Forbes K.L. (1991) Expression of tumour markers CA125, CASA and OSA in minimal/mild endometriosis. Australian and New Zealand Journal of Obstetrics and Gynaecology, 31 3: 273-275. McGuckin M.A. and Blackshaw A.W. (1991) Mating-associated peak in plasma testosterone concentration in wild male grey-headed flying foxes (Pteropus poliocephalus). Journal of Reproduction and Fertility, 92 2: 347-352. McGuckin M.A., Owens M., Wright R.G., McKenzie I.F.C. and Ward B.G. (1990) Demonstration of seven tumor-associated antigens in epithelial ovarian cancer by immunohistochemistry using monoclonal antibodies. Journal of Tumor Marker Oncology, 5 1: 87-94. MCGUCKIN, MA and BLACKSHAW, AW (1987) SEASONAL-CHANGES IN SPERMATOGENESIS (INCLUDING GERM-CELL DEGENERATION) AND PLASMA TESTOSTERONE CONCENTRATION IN THE GRAY-HEADED FRUIT BAT, PTEROPUS-POLIOCEPHALUS. Australian Journal of Biological Sciences, 40 2: 211-220. Burr, L. D., Rogers, G. B., Chen, A. C., Taylor, S., Bowler, S., Serisier, D. and McGuckin, M. (2016). Erythromycin Inhibits Expression Of P. AerugINOSa Quorum Sensing Genes In The Airways Of Non-Cf Bronchiectasis Subjects Recruited To The Bless Randomised Controlled Trial. In: International Conference of the American-Thoracic-Society (ATS), San Francisco Ca, (29-29). May 13-18, 2016. McGuckin, Mike, Hasnain, Sumaira Z., Borg, Danielle J., Loudovaris, Thomas, Kay, Thomas W., Thomas, Helen E., Whitehead, Jonathon P., Forbes, Josephine M. and Prins, John B. (2015). IL-22-mediated suppression of islet inflammation. In: Xenotransplantation. IPITA/IXA/CTS Joint Congress, Melbourne Australia, (S54-S54). Nov 15-19, 2015. McGuckin, Mike, Hasnain, Sumaira Z., Borg, Danielle J., Loudovaris, Thomas, Kay, Thomas W., Thomas, Helen E., Whitehead, Jonathon P., Forbes, Josephine M. and Prins, John B. (2015). IL-22-MEDIATED SUPPRESSION OF ISLET INFLAMMATION. In: Joint Congress of the International-Pancreas-and-Islet-Transplantation-Association, International-Xenotransplantation-Association and Cell-Transplant-Society, Melbourne Australia, (S86-S86). Nov 15-19, 2015. Lourie, Rohan, Hasnain, Sumaira Z., McGuckin, Michael A. and Florin, Timothy H. (2014). IL-22 May Maintain Colonic Mucosal Barrier Function by Overriding ROS-Induced ER Stress and Chemokine Production in Colonic Epithelial Cells. In: Digestive Disease Week 2014, Chicago, Illinois, (S825-S825). 3-6 May 2014. Lourie, R., Hasnain, S. Z., McGuckin, M. A. and Florin, T. H. (2014). IL-23 and IL-24 Upregulate Pro-Inflammatory Chemokine Genes in Colonic Epithelial Cells. In: 103rd Annual Meeting of the United States and Canadian Academy of Pathology (USCAP), San Diego, California, (192A-192A). 1-7 March 2014. Burr, L. D., Rogers, G., Chen, A., McGuckin, M. and Serisier, D. J. (2014). Peroxisome Proliferator Activated Receptor. Gene Expression In The Airways Of Non Cystic Fibrosis Bronchiectasis Subjects Is Lower Than Healthy Controls And Inversely Correlated To Total Pseudomonas AerugINOSa Bacterial Load At Baseline Entry Into A Clinical Trial. In: American Journal of Respiratory and Critical Care Medicine. , , (). .
Winkler, Ingrid G., Barbier, Valerie, Nutt, Heather L., Hasnain, Sumaira Z., Levesque, Jean-Pierre, Magnani, John L. and McGuckin, Michael A. (2013). Administration Of E-Selectin Antagonist GMI-1271 Improves Survival After High-Dose Chemotherapy By Alleviating Mucositis and Accelerating Neutrophil Recovery. In: Blood. 55th Annual Meeting of the American-Society-of-Hematology, New Orleans La, (). Dec 07-10, 2013. Hasnain, Sumaira Z., Tauro, Sharyn, Jeffery, Penny, Das, Indrajit, Tran, Thu V., Florin, Timothy H. and McGuckin, Michael A. (2012). Intestinal Endoplasmic Reticulum Stress is Modulated by Inflammatory Cytokines. In: Gastroenterology. Digestive Disease Week (DDW), San Diego Ca, (S124-S124). May 19-22, 2012. Mubarak, V, Bowler, S, Serisier, D and Mcguckin, M (2011). Pepsin as a Marker of Aspiration in the Exhaled Breath Condensate of Patients with Cystic Fibrosis: a Pilot Study. In: Respirology. Unknown, unknown, (9-10). unknown. Sheng, YH, Lourie, R, Linden, SK, Jeffery, P, Roche, DK, Tran, TV, Png, CW, Waterhouse, N, Sutton, P, Florin, TH and McGuckin, MA (2011). The MUC13 Cell Surface Mucin Protects Against Intestinal Inflammation by Inhibiting Epithelial Cell Apoptosis. In: Gastroenterology. Conference on Digestive Disease Week 2011, Chicago Il, (S635-S635). May 07-10, 2011. Walsh, M. D., Cummings, M. C., Buchanan, D. D., Arnold, S., Mckeone, D. M., Walters, R., Hopper, J. L., Jenkins, M. A., Mcguckin, M. A. and Young, J. (2010). Lynch syndrome-associated breast cancers: clinicopathological characteristics of a case series from the colon CFR. In: , , (A74-A74). .
Tauro, Sharyn B., Eri, Rajaraman D., Jeffery, Penny, Adams, Rachel J., Tran, Thu V., Roche, Deborah, Florin, Timothy H. and McGuckin, Michael A. (2009). Effect of Loss of Tolerance in a TH17 Mediated Mouse Model of ER Stress Induced Colitis. In: Gastroenterology. Digestive Disease Week/110th Annual Meeting of the American-Gastroenterological-Association, Chicago Il, (A131-A131). May 30-Jun 04, 2009. Simms, Lisa A., Doecke, James D., Fowler, Elizabeth V., Zhao, Zhen Zhen, McGuckin, Michael A., Huang, Ning, Hayward, Nicholas K., Webb, Penelope M., Whiteman, David, Cavanaugh, Juleen, McCallum, Ruth K., Merriman, Tony R., Florin, Timothy H., Barclay, Murray L., Gearry, Richard B., Roberts, Rebecca L., Montgomery, Grant W. and Radford-Smith, Graham L. (2009). KCNN4 Gene Variant Is Associated with Ileal Crohn's Disease. In: Gastroenterology. Digestive Disease Week/110th Annual Meeting of the American-Gastroenterological-Association, Chicago Il, (A205-A205). May 30-Jun 04, 2009. Walsh, M., Cummings, M., Buchanan, D., Arnold, S., McKeone, D., Walters, R., Jass, J., Hopper, J., Jenkins, M., Spurdle, A., McGuckin, M. and Young, J. (2008). DNA mismatch repair deficiency in breast cancers arising in breast/colon families. In: Histopathology. 27th International Congress of the International-Academy-of-Pathology, Athens Greece, (71-72). Oct 12-17, 2008. Inhibition of endoplasmic stress by dexamethasone: a novel action relevant to ulcerative colitis? Das, I., Eri, R., Ping, C. W., Tran, T., Adams, R., McGuckin, M. A. and Florin, T. H. (2008). Inhibition of endoplasmic stress by dexamethasone: a novel action relevant to ulcerative colitis?. In: Journal of Gastroenterology and Hepatology. , , (A214-A214). .
Linden, Sara K., Miles, Kim M., Florin, Timothy H., Dubois, Andre and McGuckin, Michael A. (2008). Muc1 limits H-pylori infection fly acting as a releasable decoy. In: Gastroenterology. , , (A117-A117). .
Mcguckin, Michael A., Eri, Rajaraman, Heazlewood, Chad K., Cook, Matthew C., Taupin, Doug R., Thornton, David J., Png, Chin Wen, Crockford, Tanya L., Cornall, Richard J., Kato, Masato, Nelms, Keats A., Hong, Nancy A., Goodnow, Christopher C. and Florin, Timothy H. (2007). Aberrant mucin assembly links endoplasmic reticulum stress with ulcerative colitis. In: Gastroenterology. Digestive Disease Weeking Meeting/ASGE Postgraduate Course Meeting, Washington Dc, (A388-A388). May 19-24, 2007. Adams, Rachel J., Heazlewood, Sharise P., O'brien, Mark, Mcguckin, Michael A. and Florin, Timothy H. (2007). Antibodies to complex microbial mixtures are a better diagnostic for Crohn's disease. In: Gastroenterology. Digestive Disease Weeking Meeting/ASGE Postgraduate Course Meeting, Washington Dc, (A178-A179). May 19-24, 2007. Eri, Rajaraman D., Florin, Timothy H., Price, Gareth, Heazlewood, Chad K., Cook, Matthew C., Goodnow, Christopher C. and Mcguckin, Michael A. (2007). Endoplasmic reticulum stress in goblet cells leads directly to intestinal inflammation with similarities to ulcerative colitis. In: Gastroenterology. Digestive Disease Weeking Meeting/ASGE Postgraduate Course Meeting, Washington Dc, (A8-A8). May 19-24, 2007. Mendz, G. L., Tu, Q. V. and McGuckin, M. A. (2007). Effects of human mucin MUC2 on the expression of Campylobacter jejuni virulence factors. In: Zoonoses and Public Health. , , (98-98). .
Sutton, P., Every, A. L., Skene, C. D., Linden, S., Harbour, S., Ferrero, R. and McGuckin, M. (2007). Muc1 mucin limits both H-pylori colonisation of the gastric mucosa and associated gastritis. In: , , (13-13). .
Walsh, Michael, Young, Joanne, Leggett, Barbara, Williams, Stephanie, Jeremy, Jass and McGuckin, Michael (2006). The MUC13 cell surface mucin is highly expressed in human colorectal carcinomas. In: 26th International Congress of the International-Academy-of-Pathology, Montreal Canada, (73-73). Sep 16-21, 2006. Sutton, P, McAuley, J, Skene, C, Harbour, S and McGuckin, M (2005). The mucin MUC1 limits Helicobacter pylori colonisation of the gastric mucosa. In: Tissue Antigens. 35th Annual SCientific Meeting of the Australasian-Society-for-Immunology/14th International HLA and Immunogenetics Workshops, Melbourne Australia, (556-556). Nov 29-Dec 02, 2005. Prig, CW, Heazlewood, SP, Story, D, Fowler, A, McGuckin, MA, Blackall, LL and Florin, TH (2005). Real time per quantification of two mucolytic bacteria in IBD mucosa. In: Gastroenterology. Annual Meeting of the American-Gastroenterological-Association/Digestive-Disease-Week, Chicago Il, (A213-A214). May 14-19, 2005. Williams, S., Antalis, T. M., Gotley, D. C. and McGuckin, M. A. (1999). Identification and characterisation of novel mucin genes. In: Journal of Gastroenterology & Hepatology: Abstracts for Australian Gastroenterology Week 1999. Australian Gastroenterology Week 1999, Brisbane Convention Centre, (A160-A160). 4th - 8th October, 1999. Williams, S., Antalis, T. M., Gotley, D. C. and McGuckin, M. A. (1999). Identification and characterisation of novel mucin genes in a mucin cluster on chromosome 7Q22. In: The Surgical Research Society of Australasia Annual Scientific Meeting. Surgical Research Society of Australasia Annual Scientific Mg, Cairns International Hotel, (2). 23-25 Sept, 1999.